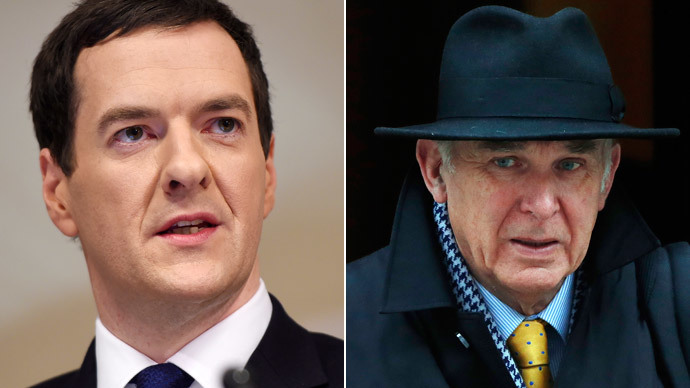 George Osborne faces mounting pressure over the HSBC tax evasion scandal after Business Secretary Vince Cable demanded that the Chancellor disclose whether he was sufficiently vigilant when it came to inquiries into the bank’s disgraced Swiss arm. Cable said he had written directly to Osborne to ensure that various probes into Britain’s government tax authority, HMRC, had been dealt with adequately. The Business Secretary’s disclosure surfaced as a scandal-ridden HSBC released a series of press advertisements to offer its apologies for the conduct of its Geneva-based subsidiary. The advertisements were issued after HSBC was engulfed by controversy over its alleged involvement in industrial scale tax evasion. On February 8 it emerged that HSBC’s Swiss private banking arm had aided royalty, criminals, terrorists, and drug dealers in dodging taxes. A colossal cache of files leaked to the International Consortium of Investigative Journalists (ICIJ) shed light on the banking giant’s clandestine practices between 2005 and 2007. During this period, HSBC's Swiss private banking arm controlled roughly $100 billion in assets. The leaked documents indicated that HSBC’s Swiss subsidiary had aggressively promoted schemes that could enable wealthy clients to dodge European taxes, and had colluded with others to hide undeclared accounts from tax authorities worldwide. After the scandal surfaced, Osborne and his team of treasury ministers maintained Shadow Chancellor for the Exchequer Ed Balls bore responsibility. Balls held the position of City Minister in 2006-07. Following a series of allegations levelled at the Tories since, however, Osborne and his treasury officials have maintained a low profile. The leaked HSBC files cast an ominous hue over the Conservatives after the Guardian revealed up to seven Tory donors legally held bank accounts with HSBC’s Swiss arm. Conflict of interest allegations were also levelled at the party with respect to ex-HMRC chief Dave Hartnett’s trajectory from government tax chief to head of HSBC’s financial crime committee. Hartnett was HMRC’s chief executive when it dealt with leaked evidence implicating HSBC in tax evasion activities. In his letter to the Chancellor, Cable asked Osborne why there had been so few criminal prosecutions when the government had been presented with clear evidence of tax evasion. He also asked what actions were being taken to regain lost tax revenue, and what lessons had been learned from the scandal. The Business Secretary condemned HMRC for taking a tough approach to ordinary taxpayers, while virtually turning a blind eye to large corporations’ tax dodging. Cable’s intervention coincides with Liberal Democrat Chief Secretary to the Treasury Danny Alexander’s letter to HMRC asking whether the tax authority was robust enough. In the letter, Alexander asked whether HMRC needed additional legal powers, whether the British government should devise new criminal offenses for those who conspire to enable tax evasion, and whether additional resources to tackle tax dodging are required. HMRC is yet to issue a response. Downing Street has rejected widespread calls for an official inquiry into HMRC’s handing of 3,000 suspected tax evaders with accounts at HSBC’s Swiss private banking arm. Since the HSBC scandal broke, two petitions have been launched calling upon the British government to seek criminal prosecutions against those implicated in tax dodging. One petition, hosted by Change.org, has accrued 43,917 signatures to date. The other petition, organized by 38 Degrees, has gathered 90,529 signatures. In HSBC’s apology, printed in leading UK newspapers, the bank’s chief executive Stuart Gulliver conceded society expected more of the banking giant. He stressed, however, the leaked files which cast light on HSBC’s involvement in tax dodging related specifically to events that occurred eight years ago. Gulliver claimed the bank has fundamentally changed in how it operates and has “absolutely no appetite” to conduct business with white collar criminals or clients involved in tax evasion.